I look forward to everyone in Ward 1 getting to know me. First, some background. I am happily married, the mother of three, and have been an Oshawa businesswoman for more than 25 years. After obtaining a B.A. from the University of Toronto I worked in a Toronto law office for a politically active Queen’s Counsel corporate lawyer. I then joined my mother in our family real estate business in Peterborough. I credit my mother's keen interest in business and politics, compassion and assistance to family, neighbours and others facing life's struggles as my strongest source of inspiration and motivation. I am motivated to invigorate and give new direction to Oshawa City Council. Specifically, my career has given me a solid understanding of citizen's concerns related to property taxes/zoning rules/business licences and city by-laws. Also, my experience as a citizen delegation at many City and Region standing committees, advisory committees and council meetings has shown me first hand the need for politicians to listen with an open mind and be responsive to their constituents. I am fortunate to have familiarity with both rural and urban life. I grew up on a Peterborough dairy farm -yes I was a 4H member; and for more than two decades I have worked with new home/resale buyers/tenants and ICI business owners. Our new Ward 1's unique blend of country and city presents certain challenges which will be well-served by a representative who is attuned to the two worlds. I believe as serving as a bridge to both. resolving our property tax affordability problem; ensuring access to efficient and safe transportation; and expanding economic growth and civic engagement. I have served on the Board of the local real estate association and coached kids' soccer teams during the years all three of my daughters played on the City of Oshawa park's league. Below are details of some efforts I initiated as a private citizen to help improve the quality of life in Oshawa and Durham Region, I list them here as examples of my commitment to bring about positive change for Oshawa with energy, ideas and action. Early in the 2010 municipal election, with Oshawa's change from the ward to the at-large system, I organized three 'Positive Discussion' events for the public to meet the new candidates. I promoted these events as a way 'to generate new ideas, improve understanding and strengthen growth'. ​The first of these debates was at Kedron Golf Course, the second at the Protection of the Mother of God Church on Ritson Road, and the third (a 'speed debate') at the former Isabella's Café, at 19 Simcoe Street South. Of the twenty-two candidates who participated in these events, nineteen signed a 'Code of Campaign Conduct' I drafted. ​In October 2010, I organized a public meeting in Columbus for Oshawa's mayoral candidates and invited Region Chair Roger Anderson, and MPP Christine Elliott as guest speakers. 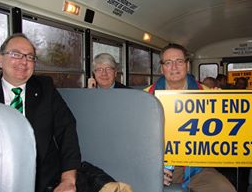 The meeting's primary focus was to raise awareness of Oshawa residents' objection to the Highway 407E Phase One construction ending at Simcoe Street and the negative impact this would have not only on the historic Hamlet of Columbus, but also on Oshawa’s downtown and on Oshawa at large. ​Subsequent to that meeting, I organized a bus rally to Queen's Park and met with the then Minister of Transportation, Kathleen Wynne. After successfully pressing the then new Oshawa Council for a public meeting on the issue, in January 2011 I met with both Oshawa and Clarington Mayors to assist with planning that meeting. ​In 2012 I organized two rallies, plus a letter writing campaign to the City and with others made delegations to Council to help save the George McLaughlin Craftsman style stone house on Simcoe St. N (known as the Windfield Farm Foreman's House) from being demolished. Although the developer owner, Minto, proceeded with the demolition, to appease the citizens trying to preserve this historic Oshawa landmark Minto gave the City $150,000 for a heritage fund. 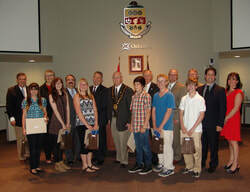 ​During the 2012 school year I directly approached the Public and Separate School Boards in Durham Region, as well as the Region of Durham Council and each of Durham's 8 municipal councils with an idea to raise awareness of local history, and at the same time involve young people in awareness of their local government. I arranged this "Local Look Back Essay Speech Competition" for grades seven and eight students to research and write about the history of their school's name and present it in their local council chamber before Council members. The top student was awarded tickets to a 26 seat group Box for an Oshawa Generals game, as well as to the Canadian Automotive Museum on Simcoe St., and the Oshawa Museum at Lakeview Park. Since first being described as 'something of an accidental activist’ in the local newspaper, to being honored with the Queen's Diamond Jubillee Award in 2012, I have continued to champion a variety of issues. In the summer of 2014 with my ideas for much needed improvements to the city, I decided to take my efforts to the next level, and made the decision to leave the real estate profession and enter as a candidate for the office of Oshawa Mayor. I saw this as a good opportunity to help strengthen Oshawa's communities and improve the City's finances. On election day out of the nine candidates I came in third, after Oshawa's incumbent Mayor was re-elected and Oshawa's former Mayor Gray came second. It was an experience I found uplifting, and one which helped me further recognize problems Oshawa has that require close attention. My vision is for City Council to have renewed vitality, openness, sterling ethics and improved civic engagement, with genuine respect and accountability to all Oshawa citizens.